One of the things we ditched when we left Portland in 2008 was our vacuum, which broke all of the time, and, as a result, we hated it. 1) Nearly every person in America dislikes their vacuum. 2) Most of the dirt suckers were not very highly rated. 3) The vacuums that Consumer Reports liked were insanely expensive. I just gave up…which, when you are married, means you pass the mantle to your spouse. Tom launched his own exploration, filled with optimism and hope. Sadly, when faced with the vitriol felt by vacuum owners the country over, he too fell into a deep funk. First, my dearest husband briefly had a geek-induced love affair with the Kirby vacuum, which costs about a million dollars and was also a carpet shampooer, floor buffer, and came with a myriad of attachments. I put the kibosh on that one. Next, he flirted with a Miele model that was going to set us back about $600. While it was reasonably well reviewed, I am just genetically incapable of paying $600 for a vacuum. 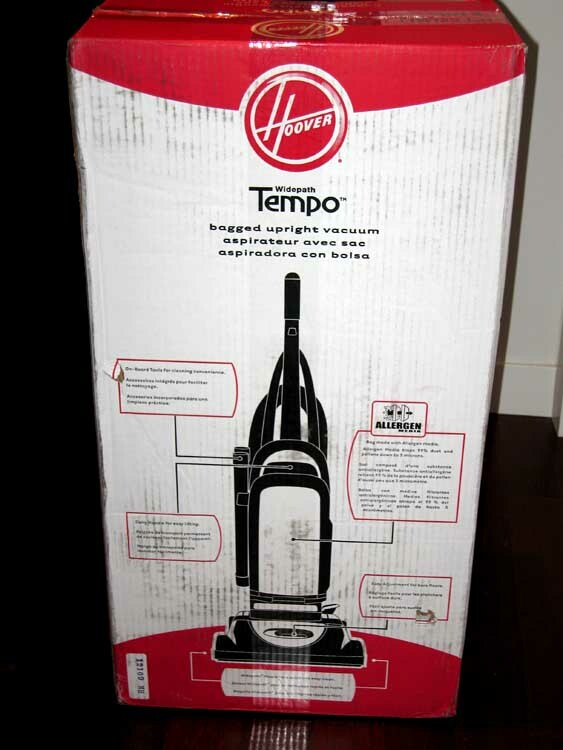 We ultimately settled on a $75 Hoover model that Amazon could deliver in 2 days for free (pictured above). I didn’t even care that it was rated a bit further down the list on Consumer Reports. It was $75 — I loved it. Report after our first use? It’s $75-good, baby. I just don’t think a vacuum could perform to my expectations if I spent $600 on it! This entry was posted on Sunday, January 17th, 2010 at 6:23 pm. You can follow any responses to this entry through the RSS 2.0 feed. You can leave a response, or trackback from your own site.